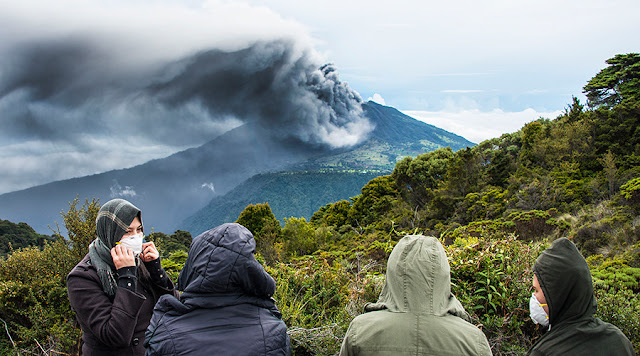 Following an increase in seismic activity, Turrialba Volcano began spewing ash, vapor and gases at 2 a.m. on Tuesday, experts from the University of Costa Rica (UCR) and the National University (UNA) confirmed. Activity at Turrialba, located in Cartago province 60 kilometers northeast of the capital San Jose, resumed Monday night with an increase in volcanic tremors, according to a report from UNA's Volcanological and Seismological Observatory of Costa Rica (OVSICORI). The report adds that the ash plume from the explosion reached approximately 300 meters (985 feet) above the volcano's crater. Mauricio Mora, a volcanologist with UCR's National Seismological Network (RSN), said windy conditions in the morning dispersed the ash plume towards the west and northwestern areas of the Central Valley. Ashes mainly reached sectors in northeastern San Jose, and certain areas in Alajuela and Heredia provinces. People posting on both OVSICORI's and UNA's Facebook pages reported smelling sulfur and seeing ash on the ground in communities north and east of the capital including Coronado, Moravia, Guadalupe, Tibas and Montes de Oca. Tuesday morning's activity, however, was not as strong as that recorded earlier this year, when ash plumes exceeded 3,000 meters (9,800 ft.) above the volcano. The new explosion followed 43 days of low activity, after the last important explosion recorded on August 1. Turrialba is one of Costa Rica's five active volcanoes along with Arenal, Poas, Irazu, and Rincon de la Vieja. President Luis Guillermo SolÃ­s toured communities north and east of Cartago on Monday and announced the allocation of ?2,4 billion ($4.3 million) for the province, including aid for farmers and ranchers whose production has been negatively affected by volcanic activity and drought in recent years. According to the Agriculture Ministry, Cartago farmers are the country's top potato producers, supplying 80 percent of all potatoes consumed in Costa Rica. They are also the largest producers of onions and large suppliers of carrots, yucca, cabbages, beets, flowers and other crops. Top gear,an episode with James May,preparing Toyota pickup,go near volcano.a metal plate was over top of pickup.a mixture of mostly water and hard of small amount would come separate. Tank and pour mixed water on the tires.But the tire still caught fire from rock pellets from the volcano and he had drive away.